To help inspire or plan your trip to Chile, some of its major attractions for travellers are shown below, including some of the best natural, historical, cultural and adventure sites in the country. These include all of UNESCO World Heritage Sites for Chile which represent the best of the world's cultural and natural heritage. Click on the icons below to focus on specific types of features (click again to return to all). 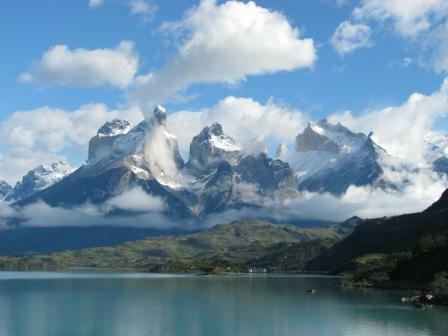 Torres del Paine National Park is one of the most beautiful and spectacular landscapes in South America. The snow-capped jagged granite peaks, lush green valleys, blue and green lakes and great glaciers of ice contrast and complement each other to produce a stunning setting. The scenery and mountainous landscape make Torres del Paine one of the world's great trekking destinations - options range from extended circuits taking over a week to day hikes. The most popular (and must-do) day trek is an ascent along the beautiful valley of the Rio Asencio up to the viewpoint overlooking the Torres del Paine (Mirador Las Torres) - the three towers which are emblematic of the park. The final ascent over rough boulders is difficult but rewarded with the view of the granite peaks rising dramatically to the sky (often with their peaks shrouded in clouds) over a lagoon and landscape shaped by glacial ice and the elements. There are numerous other trekking options as well as the chance of a boat ride on Lago Grey to get close to the blue-tinged ice of the Grey Glacier (and enjoy a pisco sour with glacier ice when there), kayaking on the lake near some discarded glacier chunks or horse-riding through the stunning landscapes. 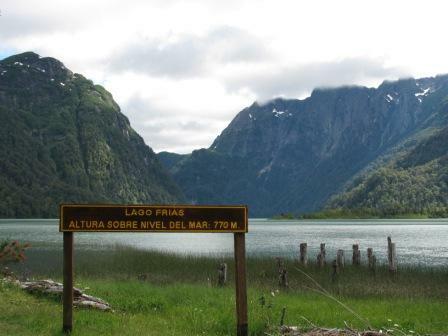 The parks other attractions include the Salto Grande Waterfall, the breathtaking views from the Mirador Ferrier and the wildlife which inhabits the park including the ubiquitous guanaco, fox, rhea, condor and flamingo. 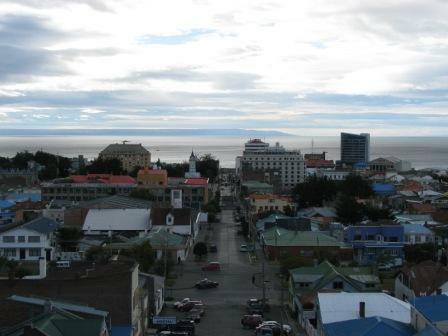 Punta Arenas is Chile's southernmost city, located just across the Straits of Magellan from Tierra del Fuego. As well as being a stopping off point for exploring Torres del Paine and Tierra del Fuego, Punta Arenas is an interesting city in its own right. Founded in the 19th century as a penal colony, the town grew rich as an important port on the shipping routes through the southern oceans and as a centre of sheep ranching. There are numerous mansions in the town which are testament to those days and the interior of the Palacio Sara Braun has been kept in its original state. The city's cemetery also has many grandiose crypts and tombstones of its wealthy families as well as showcasing the cultural diversity of the people who moved and lived here. Close to Punta Arenas at Seno Otway and Island of Magdalena are breeding colonies of Magellanic penguins. 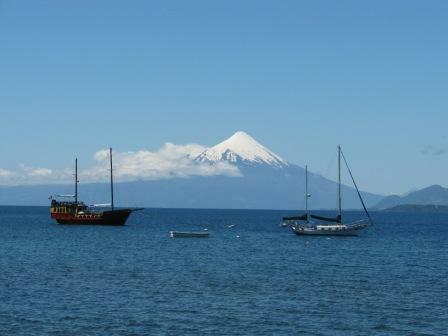 Puerto Varas is a town located on the shores on Lake Llanquihue which is a good base for exploring the beautiful landscapes of the Chilean Lake District. Known as the 'City of the Roses', the views along the shoreline of the lake in Puerto Varas are beautiful with the snow-capped cones of the Osorno and Calbuco volcanoes in the background. Trekking on the lava fields of the Osorno Volcano provides excellent views of the region towards the Pacific on one side and the emerald Lago Todos Los Santos on the other. The Valdivian rainforest surrounding Osorno also provides an excellent hiking destination with lush green landscapes and a variety of wildlife. Lava from Osorno has formed an impressive series of waterfalls and rapids for the icy blue glacier water at the Saltos de Petrohue, complete with the volcanic cone as an impressive backdrop. 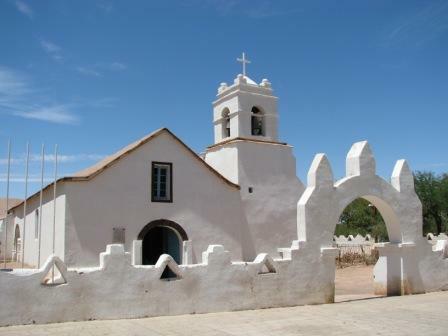 Chilo� Island is the second largest island in South America after Tierra del Fuego and is renowned for its Jesuit churches from the 17th and 18th centuries. Over 50 of the originally 100 or so wooden churches survive today, with fourteen of them constituting the World Heritage Site. The churches display a fusion between European and indigenous influences to produce a unique wooden architecture. Other attractions on the island include the colourfully painted houses built on stilts on the water's edge and the old Spanish fortress of Ancud. The historic port city of Valparaiso is Chile's cultural capital, as well as being the seat of the National Assembly and a major military base. Valparaiso reached the height of its prosperity in the 19th century but declined with the opening of the Panama Canal. Today it has a rough and faded charm but retains its romantic and atmospheric character and its cultural importance. The city is located in a natural amphitheatre setting with the bay encircled by a narrow coastal plain and a series of steep hills. Valparaiso is famous for its series of 19th century funicular elevators known as ascensors which link the steep hills with the downtown streets. The hillsides are dotted with numerous churches and colourfully painted houses and mansions, including 'La Sebastiana', the former house of the Chilean writer and Nobel Prize Winner, Pablo Neruda. 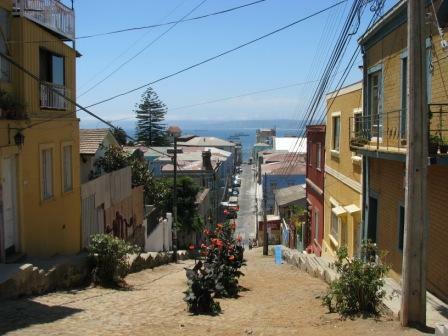 The neighbourhoods of Cerro Concepcion and Cerro Alegre are some of Valparaiso's most charming areas, with wonderful architecture and great views of the hillsides and bay. 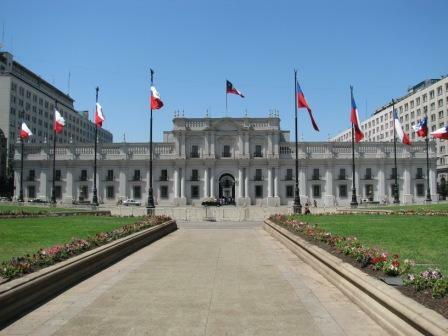 Chile's capital is a vast and busy city located underneath the Andes mountains. Its historic buildings of note include the Presidential Palace, the historic main square Plaza de Armas, the Cathedral, the monastery of San Francisco and the Palacio de la Real Audiencia, which houses the National History Museum. On a clear day, the views from Cerro San Cristobal in Parque Metropolitano are excellent - where the Andes peaks tower over the city. The bohemian Bellavista district is a popular spot with many restaurants, bars and nightclubs, as well as the unusual house of the Chilean poet and Nobel Prize winner Pablo Neruda. The Maipo Valley near Santiago is Chile's oldest and best wine-growing region. With vineyards dating back to the 18th century the estates, lying in the shadow of the Andes, are an excellent destination for a wine tour and are particularly renowned for their Cabernet Sauvignon grape. Sewell Mining Town is located 60km east of Rancagua in central Chile and was built by the Braden Copper company in 1905 to house workers at what was to become the world�s largest underground copper mine, El Teniente. The town was built on a hillside too steep for vehicles, do developed from a central staircase leading upwards from the railway station. Without vehicles there was no need for roads, so paths ran along contours of the central staircase, leading to public squares and streets lined with colourfully painted houses. The 'City of Stairs' is an excellent example of company towns built in remote and harsh locations. The oasis town of San Pedro de Atacama is a base for exploring the dramatic natural features of the Atacama Desert in the north of Chile. San Pedro itself is a charming little town of white-washed buildings, dusty streets, some great restaurants and bars and countless travel companies offering tours of the surrounding region. The Valley of the Moon is a bizarre, lunar-like landscape with strange rock formations. Even amongst the crowds, watching the sunset here is a magical experience. Elsewhere the Salar de Atacama is the world's largest salt lake, its rich mineral deposits attracting many flamingos and other birds. The Geysers of El Tatio, located at 4,500 metres and surrounded by volcanoes, are best visited in the morning to see the water and steam hurling up from the geysers, thermal wells and fumaroles, with the morning light producing a magical effect. Other options in the area include scaling up and sand boarding down the sand dunes of Death Valley, visiting the Puritama hot springs and hiking some of the nearby volcanoes. The Humberstone and Santa Laura saltpetre works were located near the Atacama desert in the remote Chilean Altiplano and were used to process the largest deposit of saltpetre in the world for over 60 years from 1880. This produced the fertilizer sodium nitrate that was to transform agricultural lands in North and South America and Europe. The workers at these plants, from Chile, Peru and Bolivia, lived in company towns and formed a distinctive communal pampinos culture which promoted solidarity and enabled them to fight for social justice, having a profound impact on the social history of the region. Rapa Nui, or Easter Island, is one of the most extraordinary archaeological sites in the world and one of the most mysterious and isolated destinations in world travel. The island was settled between the 4th and 16th centuries by a Polynesian society, who developed a unique culture free from outside influences and left the distinctive monolithic stone statues, or moai, as a reminder of their culture. Of the 800 or so maoi originally built, some 400 remain today in various stages of completion and repair, ranging in size from 2 to 21 metres. The maoi were constructed from solidified lava at Rano Raraku and transported to their sites of erection on wooden rollers - this resulted in the deforestation of the island and the barren landscapes seen today. In addition to the maoi, there are ceremonial shrines or ahu, raised rectangular platforms some of which have associated maoi or tombs, and pictographic writings (rongo rongo) which are still undeciphered. After flying the 3,790km from Chile to Easter Island, you will arrive in Hanga Roa, a small town of less than 4,000 inhabitants but a good base from which to explore the island. Some of the main maoi sites include Ahu Tongariro with 15 restored moai right on the coastline, Ahu Vaihu with 8 toppled moai lying facedown on the ground and Anakena on the northern coast with a perfectly restored maoi overlooking the beach. The ceremonial village of Orongo in the south of the island is one of the most culturally important sites where the warriors of the Birdman Cult would swim to the nearby island of Motu Nui in search of the first of the eggs laid by the manutara, or sooty tern, each year. There are several important ruined buildings and petroglyphs at this site.